I have many weaknesses and they all depend on time of year or time of week or kind of mood. I’m not talking character weaknesses, of which I have so many, I could create a whole new population! I’m talking about those weaknesses that make you jittery in the knees. Like a handsome guy passing you on the street( ladies..! ), or a stunning woman smiling at you(for the men..!! ), or that pair of shoes in the window whispering: “buy mee, buy mee…” all the while next to you, you see the man in your life droolingly staring at that iphone in the window next door. Weaknesses. As I said,I have many. But not in the line of clothes or make-up, or even kitchen gadgets. Maybe perfume? But my knees do go jello when I see old linen. Silver. Glasses. Old etchings. OLd books! Old postcards. 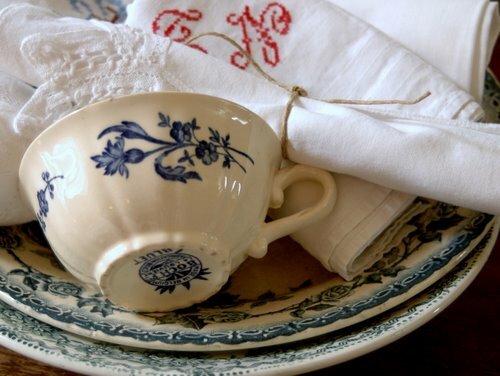 Old tableware. 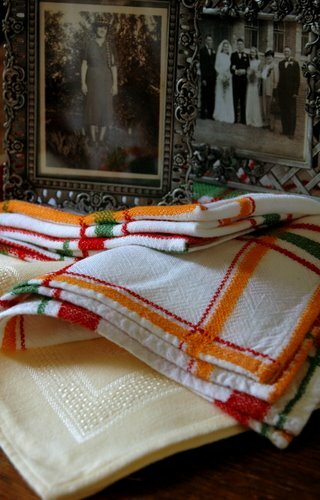 Old kitchen towls. 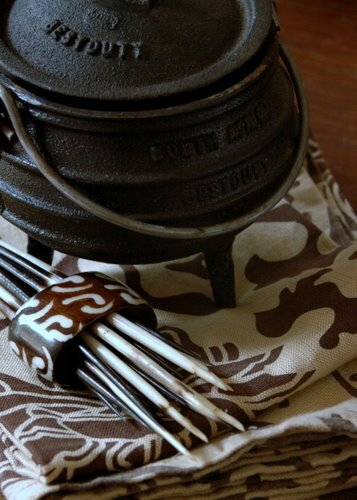 Tablecloths. I’d better stop. At the moment I am the napkin phase. I love eating with a fabric napkin. Old, new, classic, contemporary, embroidered, monogrammed, linen, cotton, colourful, white.. In summer we are loud and modern bright, fun and frivolous with our summer tables. 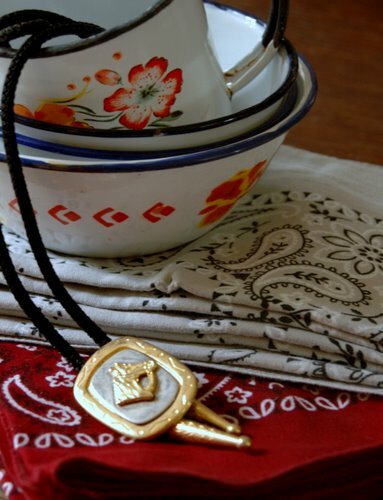 In winter I turn to old and classic, warm, heavier storytelling table ware. And the napkins of course, have to play along…whites and soft greys, dark aubergines and burgundies. Here at the dawn to autumn, I have grown a bit bored with all the summer napkins we used, so I got seduced this morning into indulging in a few new autumn-spirited napkins, which I couldn’t wait to use with dinner! And no, I don’t spend a lot of money on a napkin. I have a rule as to what I’ll pay for a napkin and I never cross that line. To buy expensive everyday napkins , would be obscene. And thus far I could find pretty, elegant, stylish, fun, wintery…every kind of napkin I desire, within my set budget boundaries. Of course there are beautiful ones far above my rule script, but I would have to leave the price tag on so people would see it and then be too intimidated to wipe their mouths and so the napkins would remain forever unused. If you have the time and a sewing machine, it becomes even cheaper and your choice of fabric is endless. But another rule when making your own(of course to be broken if you so wish, that is why there are rules..?) 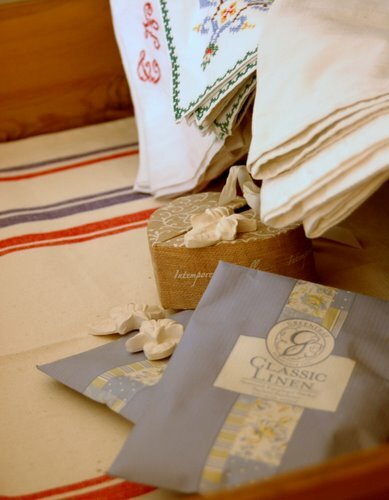 is to keep the napkin simple, easy washable and of a natural fabric like cotton. Leave the trimmings like buttons and boughs for your cushions. Napkins should be simple. Unadorned. No, I don’t do any napkin folding. No swans, or donkeys, or rabbits or candles swooning next to my plate. No flowery creations suiciding over wine glass rims. Just simply folded(with the monogram or the embroidery on top, if any), or rolled and stuck into a napkin ring. And NO STAINS!! Therefore you have the trusted old soap- and- soak trick, letting it dry in the sun. Treat your stains as soon as possible and DON’T EVER iron on a stain. So. You’re thinking: “Fabric napkins! Urgghh! Work! !” Maybe. Or not? Isn’t it the washing machine who washes it? Or even the washing services? OK, yeah yeah yeah, it still needs to be ironed, but isn’t all the trouble a small sacrifice compared to the delight of having a lovely napkin beside your plate? So. How about an inspiring napkin drawer? Napkins neatly folded. Some maybe rolled and tied into a bundle with an oh, so pretty ribbon. And on the side in the drawer, interesting napking rings in a small basket, bowl, old tin, or pretty covered little box(that your creative self decorated at almost no cost! )Any fragrant herbs for repellant as well as perfuming? You wouldn’t want a guest, or yourself, bringing a musty, dusty smelling napkin to his/her mouth, that area right under the nose? After spending time and energy and thought into preparing a meal, you owe it to yourself and to the food to present it at the best table you can create. It is called respect. For yourself, and your hard work, your guests and for the food you prepared. 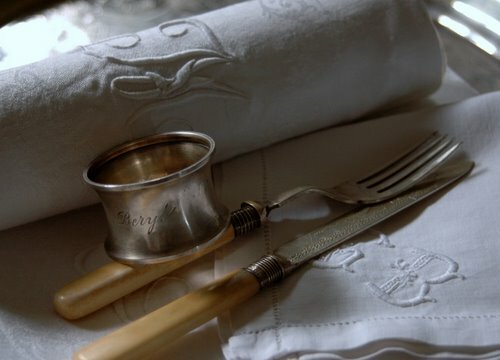 …an inspiring napkin drawer makes for inspiring tablesetting. It doesn’t have to be expensive. It only has to be inventive and creative…. 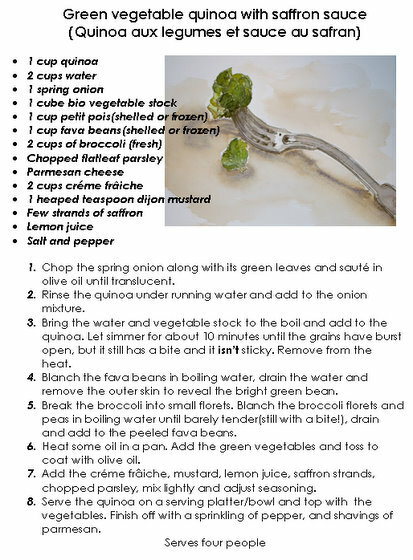 This is eaten like a risotto…only with quinoa, but use arborio rice and you can have a green vegetable risotto. Subsitute half of the boiling water with dry white wine. Any green vegetables can be used, or other for that matter. 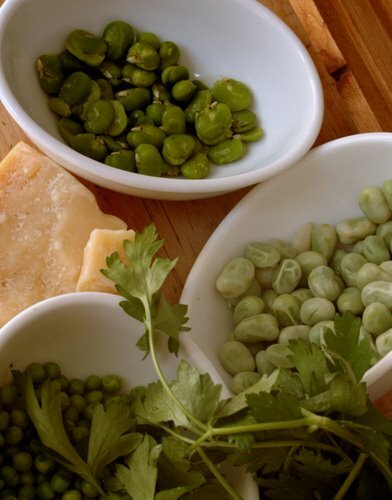 If on a diet, don’t mix the réme frâiche with the vetables, but serve it on the side, as I did in the photo, but still do toss the vegetables with some olive oil, a squirt of lemon juice and seasoning. Top off with some tasted almonds or some sunflowerseeds for crunch. Play around, and don’t skimp on the vegetables! 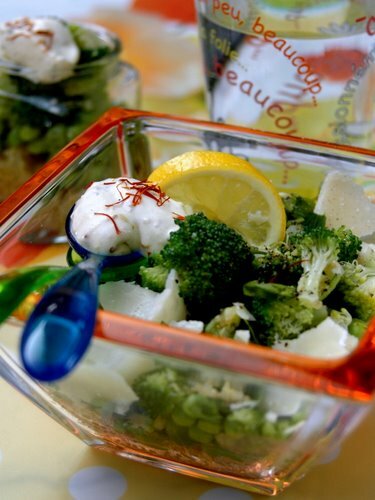 Next Article Velouté de brocoli et fleur de sel à la vanille. Wow that is a beautiful collection of table cloth and Napkins you have there. I have never had quina, i think I should check out next time when i am in the shops. 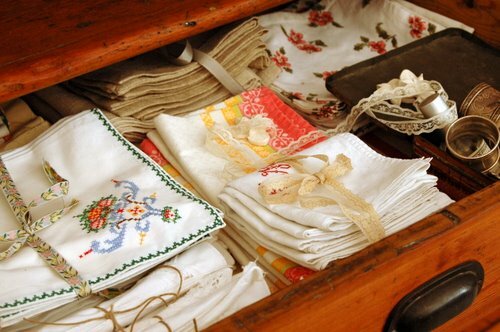 Great photos…I am going to have to post a picture of my napkin drawer for you…I must have over 60 and always use them when we have people over for dinner. A paper napkin just does not cut it. Now that you are home, it appears that you are down to business in the kitchen….. 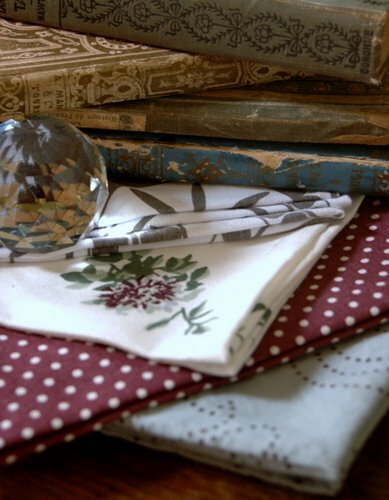 I love fabric napkins, too only mine are run-of-the-mill floral prints. good lord, i am not surprised, these look absolutely gorgeous! i have been looking for a good boot sale here in the uk for the longest time, apparently there are some where you can get real beautiful tableware for next to nothing… but nobody has let me into their secret yet! i could do way more to do nice table settings, i am usually so entrenched with my food that the set-up is an afterthought. They mean so much to me..Your photos are so lovely..your artwork..the words..
We are singing from the same page! I have a drawer almost full of napkins I made for my 50th birthday party. I was lucky to find a bagful of out-of-season furnishings swatches, all 300mm square. And all toning colours/patterns. A simple hem, with matching thread and voila! Not too big for finger food, easily washed. 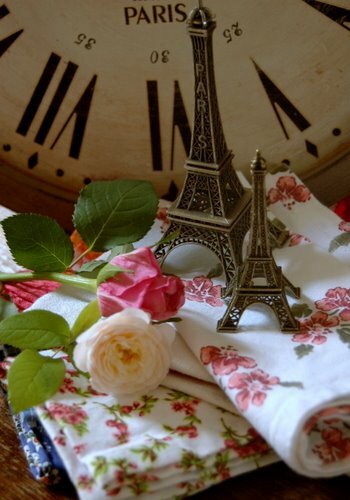 Love the post….I use cloth napkins everyday. I agree, its no trouble to wash and iron. Adds such a beautiful touch to a meal. What a delightful & healthy summer meal!! I so want to savour it!! How wonderful…we have something in common. I too have a napkin fetish. I must have at least 100 of them in sets of 4,8 and twelve. Mine too vary from everyday ones,some that I have sewn, to beautifil Irish linen ones and some very old ones that I have inherited that I believe were embroidered by family members in Europe. Recently I have read much about quinoa, but have not yet bought or tried it even though I have heard it is high in protein. Certainly something to look into in the future. You must have a great collection! 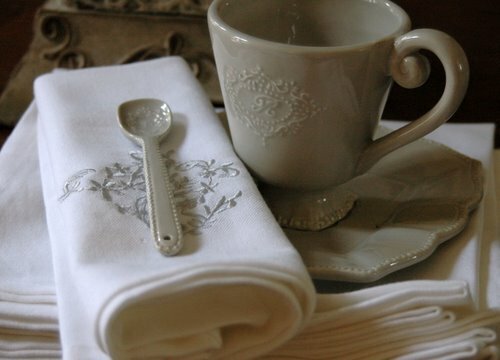 I always use cloth napkins, and I decided it was an environmental choice, but my mine are plain and ordinary. Your quinoa dish looks fantastic! J’ai un petit faible pour le quinoa, qui est une pure merveille et qui change de la semoule…Je suis friande des belles salades et la tienne est superble, bravo !!! !